This hip and trendy travel brochure would be perfect for a travel agency targeting a younger clientele, or an agency specializing in urban city tours and packages. 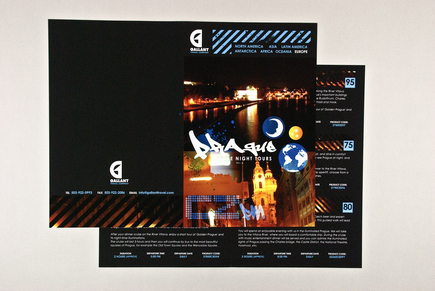 The graffiti font and edgy horizontal lines are exciting and modern, while the brochure itself contains plenty of space for important details on tours and trips. Can I make this design work for any industry? Of course! This graphic design template may have been inspired by a particular industry but if you like the way it looks you can change the wording and elements to suite your own need! Once you buy the file just open it open and change it however you like! 30% Off Sale Running Today! Free 3-5 day ground shipping to lower 48 US states. Rush and International shipping options available for an additional fee. Email care@inkd.com after placing your order to upgrade. After checkout you'll be emailed instructions on how to send your design changes. All website content is Copyright © 2019 Inkd.